If you’re unlucky enough to live somewhere other than Atlanta, you missed the amazing weather we had this weekend. It was absolutely incredible outside both days. 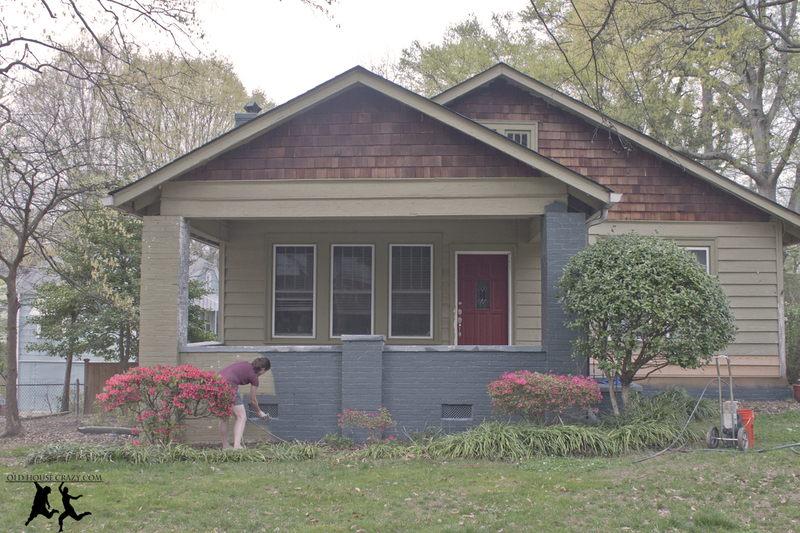 With that in mind, Christy and I decided to spend the days working towards completing our exterior paint job, something we’ve been laboring on since the summer of 2010. I know that sounds like a rediculously long time to have been painting. 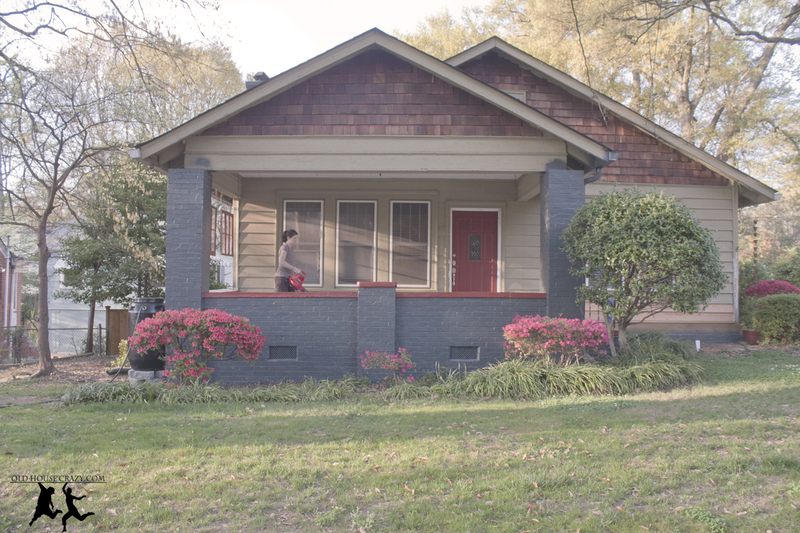 Well, have you ever painted a house? Oh, you have? 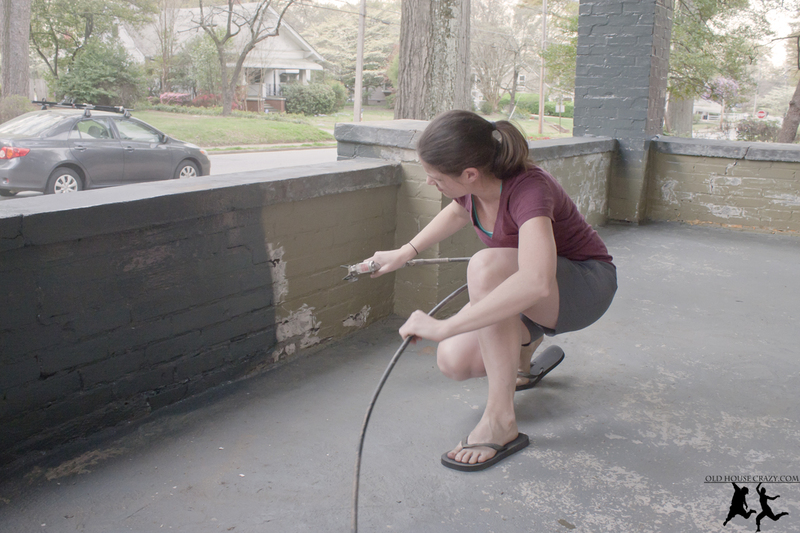 Well, did you first remove 90 years of lead-based paint from pine siding using a hand scraper? If you’ve done that, you have my respect. 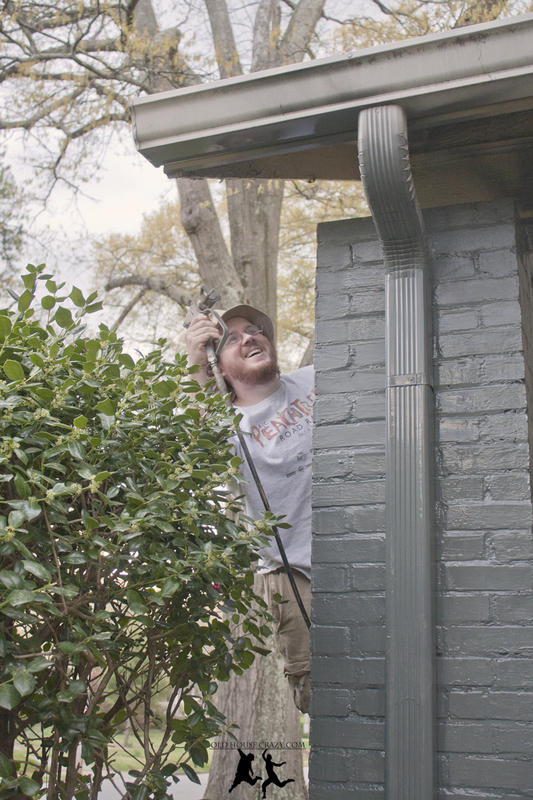 Like most of our DIY jobs, this one was originally motivated by money, or a lack of it. A paint job like the one we’re doing would have cost us upwards of ten thousand bucks. Our house was painted the pea soup green color you seen in the pictures, with the foundation a single shade darker, but still pea soup green. We don’t really like these colors, and haven’t liked them since we bought the place. In the years since it was built, our house has spent most of its time white. I know this because of the many layers of white paint I’ve removed. If all that white paint had been in good shape, we would have simply painted over it in the colors we wanted. But that’s the problem: the paint had chipped over the years, and many generations of painters had painted over the missing spots without sanding or removing the paint that was still intact. This left us with a paint job that was really uneven and ugly. 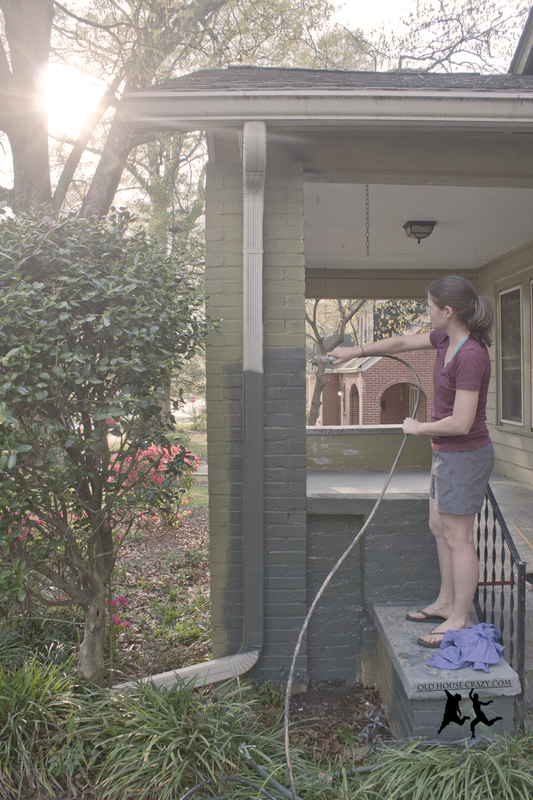 If we pressure washed the house, as recommended by numerous folks, and painted over, we’d have been left with another rough and poorly done paint job. 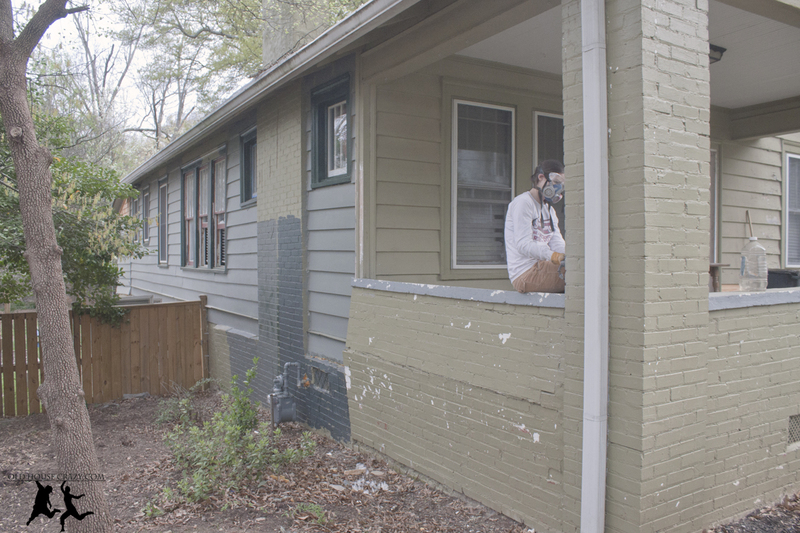 That wasn’t good enough, so we decided to remove ALL of the old paint, recaulk the siding boards, re-glaze the windows, restore the pulleys and weights that operate the window sashes, and paint the place the way it was supposed to be painted. I ignorantly believed this could be done during my spring break in 2010. I set out that week to paint my whole freaking house. HA. I ended up scraping about 50 square feet of the back wall. It’s been a two year job so far, but the only money we’ve spent is on paint and supplies. I’ll blog about the scraping, caulking, glazing, and painting the walls later. For now, the porch. 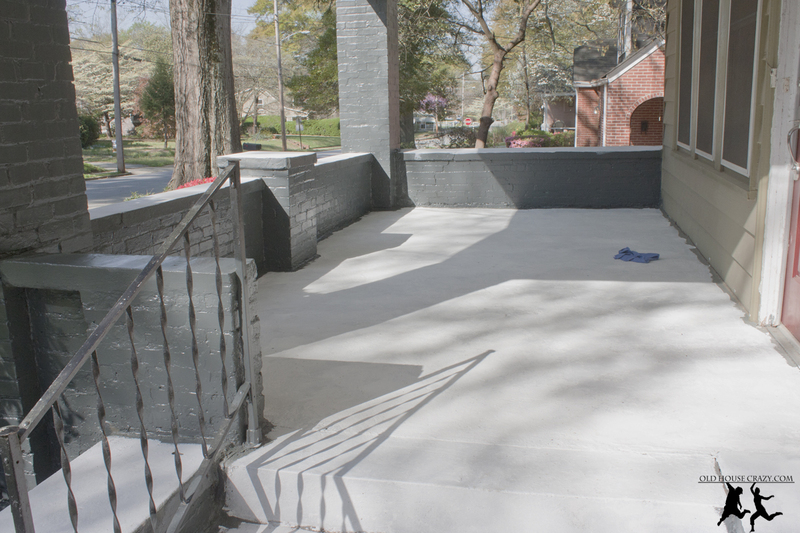 We decided in the fall to go ahead and paint the foundation and the porch so that we’d have that done (the back and one side are completely finished). So we set out and pressure washed the whole place. Then it got cold and we never finished. This weekend, it was warm again, so we finished up the foundation. 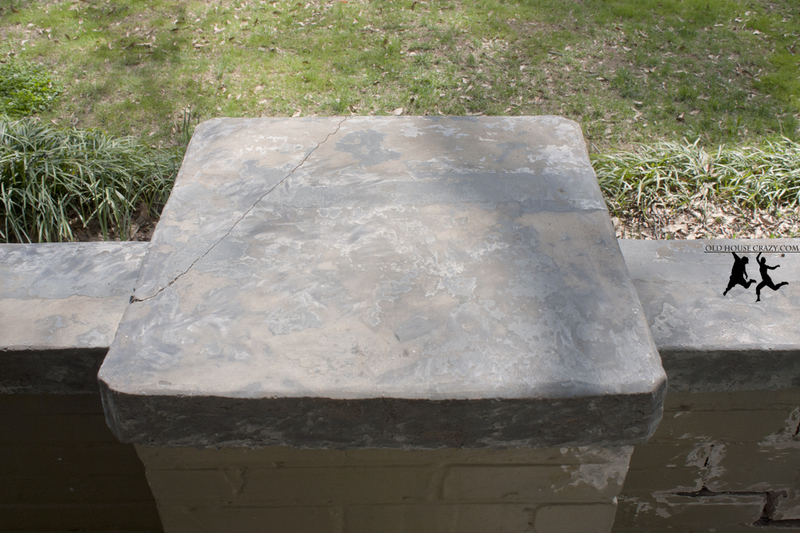 We began be using the angle grinder and a cup brush to remove the chipping paint from the bricks and smooth the rest. You can see Christy using this machine (with an approved respirator – lead paint – gotta be careful) in the first picture of this post. Next, we used a broom to sweep away as much of the dust, dirt, and pollen as we could. Then we used the electric blower to complete the job. After it was dust free, we hosed it down to be sure. 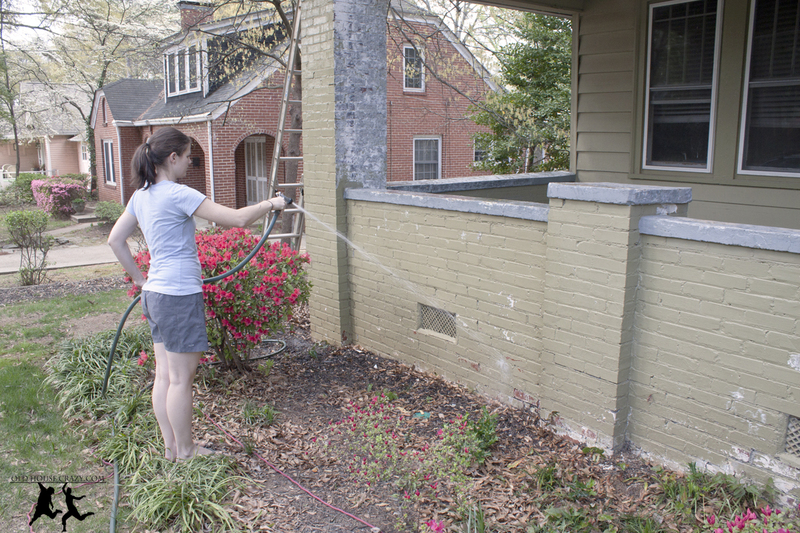 The walls still looked pretty nice from when we pressure washed it a couple months ago, so we didn’t feel that we needed to repeat that process. Once everything was dry again, we hooked up Christy’s Dad’s paint sprayer and got busy. 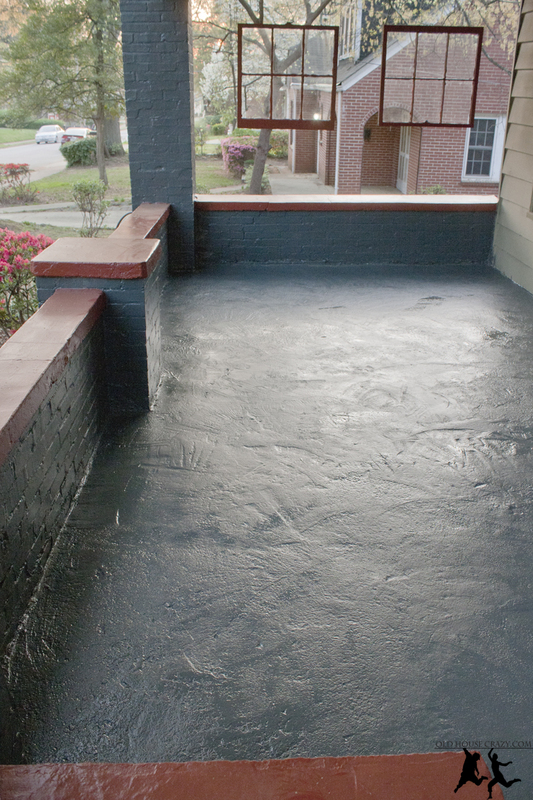 I sprayed around the foundation and Christy did most of the spraying on the porch, as you see in the pictures. It really is nice to have a wife that’s not scared to get her hands dirty, use power tools, and drink beer. 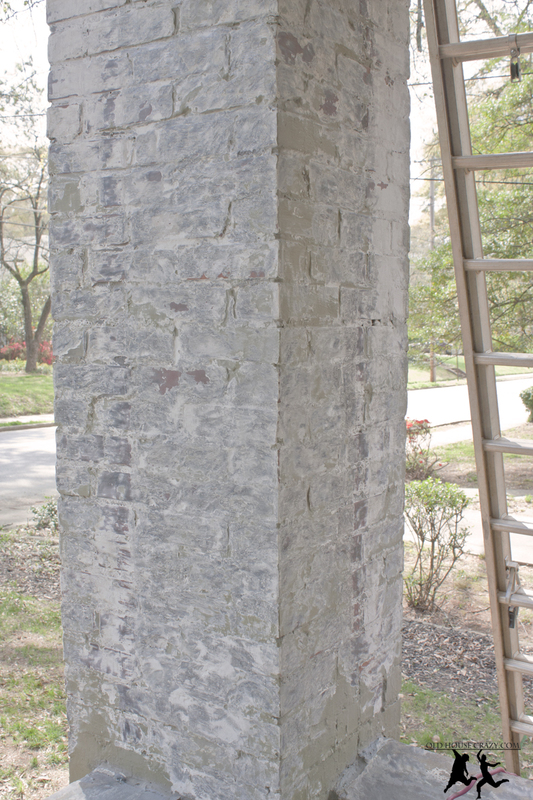 We didn’t use any primer on the bricks because most of the surfaces were still covered by a little paint or primer in good condition after our grinding and washing. 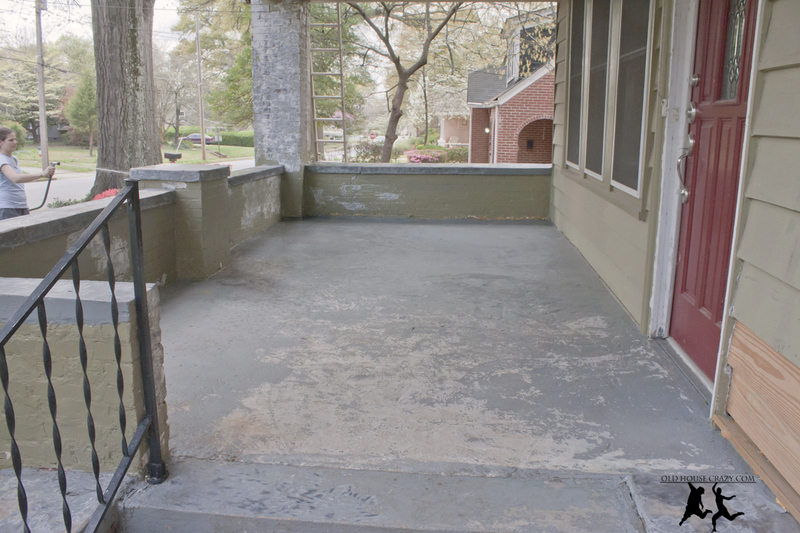 On the floor of the porch and on the caps, we removed much more of the old finish, so we primed with a masonry / block primer. The next morning, after the primer had set up, I painted the caps red using our accent color. It looks a little funny now, but once the place is done, hold on to your hats. If you don’t have one, go buy a hat so that you can hold the heck on to it. 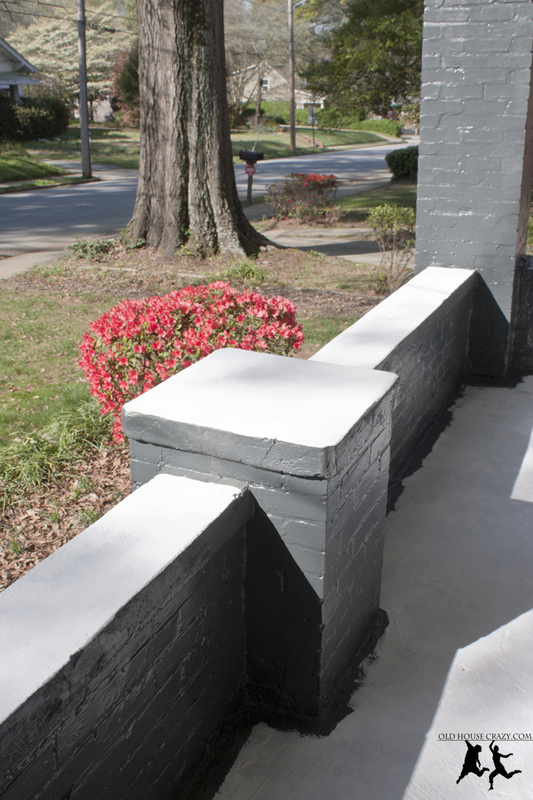 This entry was posted in Don't Hire a Professional, Front Porch, Painting, Tools and Techniques and tagged DIY, diy project, don't hire a professional, paint job, porch. Bookmark the permalink. Nice paint job! I like how you went through the extra effort to strip the old paint before repainting. That should make for a very good paint job that will last a long time. I hope your paint lasts longer than ours did. The heart pine would not hold paint – it chipped off way too quickly for what it cost to have it painted again – and it didn’t matter what kind of paint we used. I really like the red with the dark gray you are using. Somehow, I had missed this post.